Businessman and likely Republican presidential candidate Donald Trump will be returning to Iowa tomorrow to speak and meet with conservative leaders in the state. He also announced additional hires to his Iowa campaign staff. 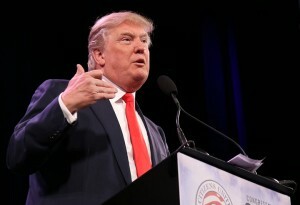 Trump will be in Iowa to meet with Warren County GOP leaders, the Republican caucuses of the Iowa Senate and House of Representatives, and to speak to College Republicans at Simpson College. He will also have meetings with key central Iowa conservatives aboard his private jet at the Des Moines International Airport. Additionally, Trump announced three new hires to his Iowa staff — Ryan Keller, Brad Nagel and Chris Hupke — who will serve as advisers alongside veteran Iowa campaigner Chuck Laudner, who is widely considered to be the most respected grassroots operative in Iowa GOP politics. “Ryan, Brad and Chris are extremely valuable additions to our growing team and we look forward to sharing Mr. Trump’s vision to make America great again with the hard working people of Iowa,” Laudner said.